Make a simple Arduino audio player that plays .wav files from an SD card in as little as 10 minutes. 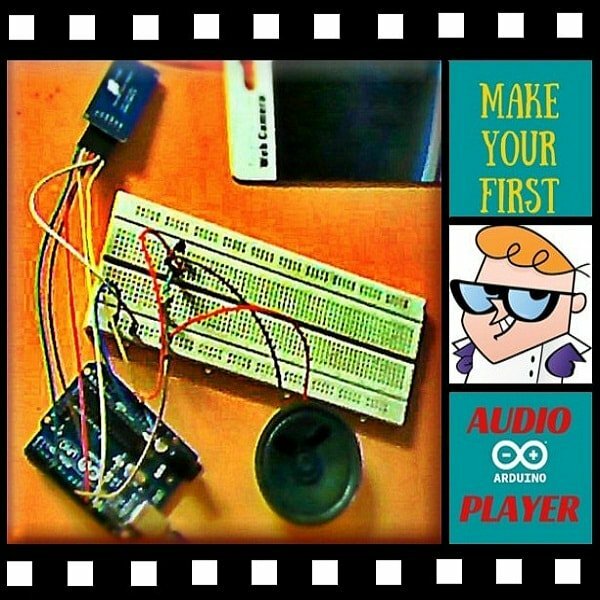 This is a simple and fun Arduino project you can build in 10–15 minutes — an Arduino audio player that plays ".wav" files. It consists of a speaker, a simple transistor acting as an amplifier, and a micro-SD card adapter for a micro-SD card that holds the .wav files. The Arduino in the circuit shown below loads the .wav files from the micro-SD card. It then generates a signal and outputs it through the speaker connected to digital pin 9. This allows the speaker to create sounds and play music. 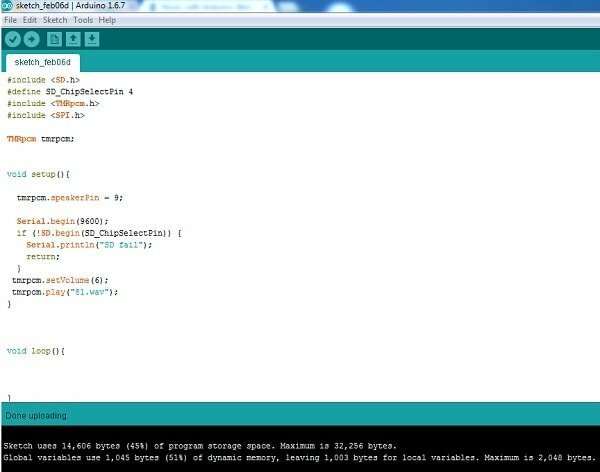 In this tutorial, I have programmed the Arduino audio player to play "Rain Over Me” by Pitbull and Marc Anthony. 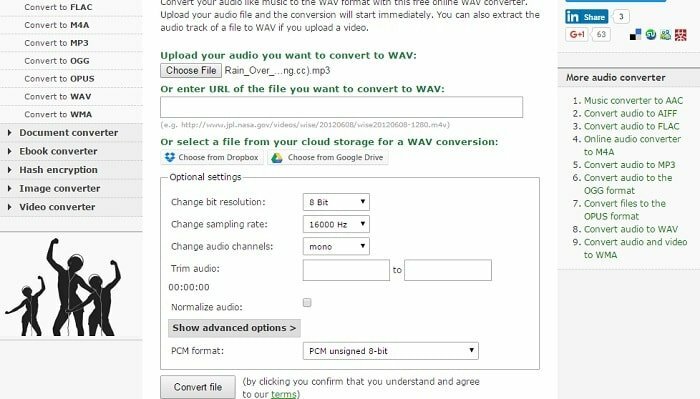 You don’t need to install any software in order to convert the songs to .wav files. There's an online music converter to do the work for you. Upload a music file or enter a link for the song or audio file to be converted. You can even choose files from Dropbox or Google Drive. In optional settings, change bit resolution to 8 bit. Change sampling rate to 16000 Hz. Change audio channels to Mono. Set the PCM format as PCM unsigned 8-bit. Click on "Convert", and the files are converted! 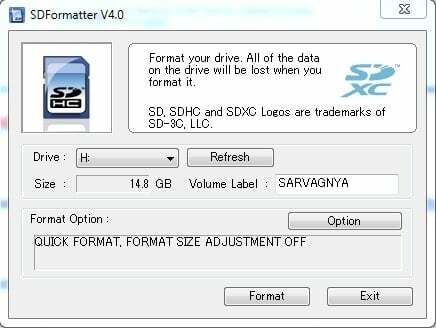 Download the SD Formatter tool. Select the proper drive to format. Name your card by filling in the Volume label field and click the "Format" button. It will prompt you with a couple of dialogues. Click on them, and your card will be formatted! Add the previously converted .wav files to the card and save them with simple names such as 81.wav. CS — Depends on your SD card shield or module. 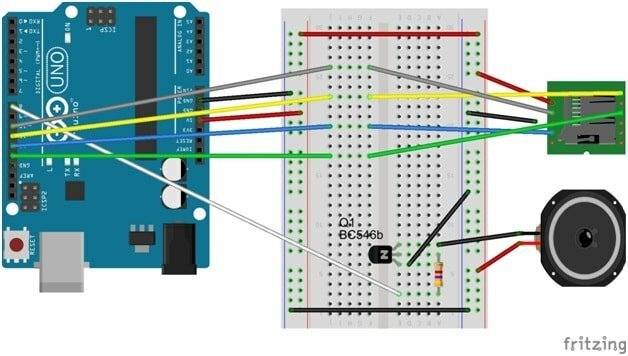 Pin 4 is used here for consistency with this Arduino code. Plug in the power, and your Arduino audio player will successfully play a song. You can see the working demo in the video below.